Interests: would love to see some honesty around this site. You didn't follow any of the instructions but to post a HJT log. We need some scans too, Panda and MBAM please. You can run scan only in HJT and put a check next to the line below and then click fix. Are you using IE and logged in as an Administrator? There is a tutorial on how to run the scan at the top of this forum. C:\HJT\Administrator.exe <=== don't rename the program. Or put it in with another program. HJT in a folder all it's own on C. I missed that before. Please make these corrections and after the Panda scan run HJT again and post the log. If you can't get Panda, then just post the HJT log from the correct location please. I'm using AOL as my browser (based on IE? It seems so.) Yes, with administrator priviledges. 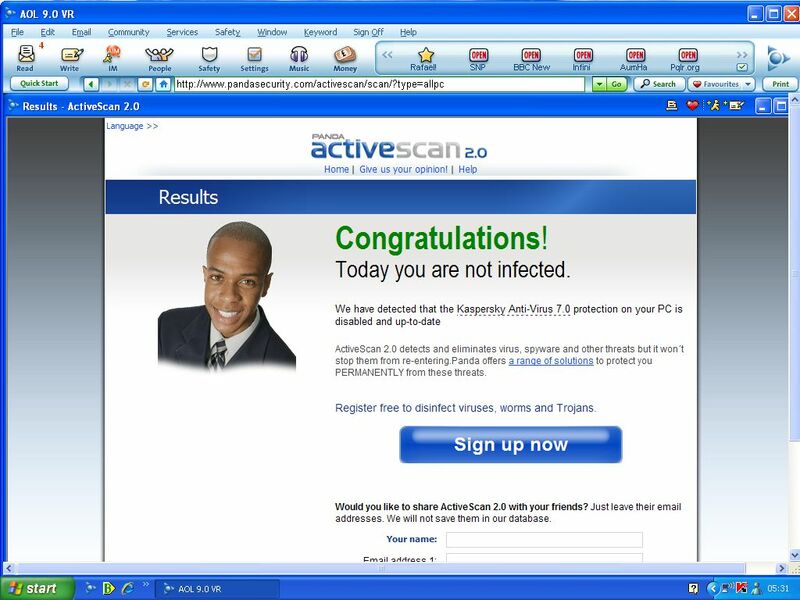 http://www.pandasecurity.com/activescan/scan/?type=allpc is the URL I've visited and run a scan. This time I ended up with a 'Congratulations - Today you are not infected!" ......... but it mentioned that my Kaspersky AV7 (loaded from a CD) is disabled (???) - Screenshot attached. With regard to HJT, I hope I've done as you require. I'll post another HJT log shortly. Well I don't see anything bad. Those two should be cleaned up with HJT. Your log looks clean. We need to now reset a clean System Restore point. If you don't and you need to use System Restore you will reinfect yourself. Go to Start>Control Panel>System. Click on the System Restore tab and put a check in Turn off System Restore. Then click OK.
Now go to Start>Help and Support > Undo Changes to Your System or System Restore depending on the make of your PC. Click on what ever will open the System Restore box. You will see two options, Choose Create a System Restore Point. Give it a name like Clean Restore Point and today's date. Now if you need to use it you have it. Many of these infections can be avoided with an added layer of prevention. All recommended programs are free and easy on system resources. You should install them as part of your protection arsenal. Keep MBAM and Spybot Search & Destroy and always immunize SBS&D when you update. You will also need at least one other scanning program Asquared or SuperAntiSpyware are good and there are several other excellent programs with free and paid versions. Read the overviews of what each program below does so you have an understanding of their importance and how to use. A firewall and antivirus are also essential. The Windows firewall in XP is not sufficient. Preform Windows Updates monthly on the second Tuesday or use automatic updates, and use your scanners weekly at the least. Always update before you scan. Keep other software known for vulnerabilities updated also. Use the Secunia Inspector free scan to identify risks in outdated versions. I've tried to delete the two items you mentioned in both normal and 'safe' mode. They have resisted and will not be deleted! They are not malware I was just trying to clean them up. All of those you can give a try but it's nothing to worry about. Thanks for your advice, Jean! If I were to click on every item found by HJT, what is the worst case scenario I would encounter? Any chance of an answer to this query! PS In the screenshot earlier, Panda said my KAV7 was up-to-date ........ but disabled. How can I tell? It looks OK on screen. Total destruction of the system. DO NOT do that. HJT doesn't identify malware unless your knowledgeable in those things. See if you can run the AV. Update it, run a scan. Turn on the Windows Security System it will tell you if its disabled too. Where is the best place to learn how best to use HJT, Jean? My AV seems to be running just fine and Windows Security reports all is well. Curious that Panda reported it as being disabled! A malware removal school like Malware Removal University, Geeks 2 Go, What the Tech is your best bet for learning how to use HJT. It is a diagnosis tool not a malware scanner. The majority of items you see in a HJT log are valid and crucial system items. Those are schools that can teach you. Do you place any credence at all with http://www.hijackthis.de/ - I've had some interesting results when I've copied and pasted the HJT logs of those with major infections (just to see what was found!). Have you ever tried it? Interesting results? Online analyzers are not safe or reliable. They might show you something that should be removed or they might not. No one I know uses them with confidence or recommends. OK Jean. Thank you for your views and comments. You may close this thread if you wish! Since this issue is resolved I will close the thread to prevent others from posting into it. If you need assistance please start your own topic and someone will be happy to assist you. The fixes and advice in this thread are for this machine only. Do not apply to your machine. Please start a thread of your own and someone will be happy to help you.